My successful query letters are some of the most popular posts on Write Naked. That interest and my crazy-organized-tendency to catalog everything prompted me to gather all my queries in one place. Since Magazine Queries That Worked came out in print one week ago tomorrow, here’s an excerpt from it for a query from my first year of freelancing. 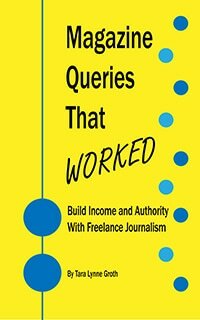 Note: If you are reading this before July 1, 2017 – you can get a copy of my book AND recordings of seminars on freelance writing by contributing to my Project Freelance 2017 campaign. All contributors get recording access, regardless of the amount they contribute. The campaign closes in less than 48 hours! Outside of my journalism work, I also write web content and provide content marketing for businesses. One of my clients was a weight loss camp for teenagers. I wrote the camp’s newsletter, press releases, social media updates and some of the web content. I became familiar with the consumer perspectives of parents and children. Also, childhood obesity was just beginning to be discussed and addressed seriously. At the time, First Lady Michelle Obama made awareness and prevention of childhood obesity a prime focus of her efforts. I knew magazines are busy in the winter slating their spring and summer content, so I thought an article in a parenting-focused magazine about weight loss summer camp options would fit well. In correspondence with the editor, we decided a better angle would be chronicling and explaining the various ways of covering the costs of a summer at weight loss camp. A short time at camp could cost several thousand dollars—and, as noted in my article, some weekend stays are $1,000. Parents would likely need to pay for the cost of child care for the balance of the summer before and after camp takes place. Scholarships, payment plans, crowdfunding and other sources could help offset or completely cover tuition—and not all parents are aware of these options. A simple internet search led me to funding sources, loan providers and health insurance companies with programs tailored to covering weight loss efforts. Heart disease in their thirties, arteries of 45-year-olds—these are characteristics of one in six children, and more are at risk. According to reports released earlier this year by the Centers for Disease Control and a recent article by CNN’s John Blake, most children today are obese, and they’re not aware of the lifestyle changes available to maintain a healthy weight. “Best Weight Loss Options for Kids and Teens” will be approximately 800 words. It will focus on the opportunities parents can explore with their children—such as restrictive diets, gastric bypass surgery, weight loss camps and change of lifestyle. The piece will include expert advice from certified nutritionists, weight loss camp directors and former campers from around the Southeast. Interested in this piece as a feature in Chesapeake Family? I am available to discuss your ideas and thoughts. I am a freelance writer residing in Morrisville, North Carolina who has written about weight loss camp options for Suite101. My work has also appeared in Southern Neighbor, The Stony Brook Press and the Providence Journal. You are welcome to view clips at http://www.taralynnegroth.com. Great query as always. I’m working on a few. 🙂 Best of inspiration writing this.